Holohan's at the Barge is a family run restaurant serving traditional Irish dishes with a modern twist. Holohan's is Belfast on Riverside restaurant, situated on the edge of the River Lagan. First visit - really enjoyed the whole experience. Will definitely be back. Great food. Great service. Great dining experience. Loved the situation of the barge. A beautiful night when we visited so the surroundings were fabulous. Food was a little expensive but the taste of the dishes we ordered were fantastic. Would and have recommend a visit. Really enjoyed this restaurant. Lovely setting, tasty menu and friendly staff. Will definitely be back. Thank you! The soup wasn't hot enough and the monkfish had sinues which were unpleasant. Other than that the food was nice. I highly recommend The Barge for food and service, one of my favourite places to eat in Belfast. We picked here for a birthday dinner and it was fabulous. The food was beautiful and the staff very friendly and knowledgeable about the dishes and area. Would go back in a heartbeat! We enjoyed a really beautiful Sunday lunch in the unique setting of Holohan's at The Barge on Belfast's River Lagan. 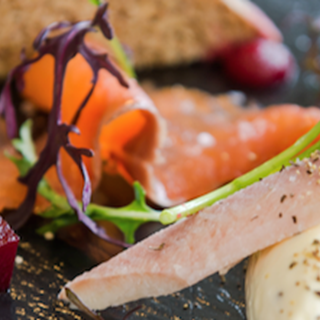 After a very warm Irish Welcome, we were treated to an indulgent smoked trout starter beautifully presented and so tasty. Then I had the roast chicken with a yummy crispy skin and gorgeous potatoes. We also shared and loved the lemon sole dish, followed by a chocolate work of art dessert that looked almost too beautiful to eat. All washed down with a beautifully chilled bottle of Montagner Prosecco Valdobbiadene DOCG Superiore, our meal was pure quality all the way. Sean and Derek did a fantastic job as our warm Irish hosts and we can't wait to try more of the fabulous dishes on the menu. I have been here a few times and it never fails on quality and comfort. I was meeting some friends for lunch and we were very happy with the quality of food and the relaxed atmosphere. We each at the seafood boxty and it was very tasty. We shared a cheeseboard and beetroot/chocolate/guinness cake and it was most enjoyable. The whole dinning experience was A+! I really like this place. It has wonderful food and wonderful staff. It isn't stuffy or pretentious either - just very well prepared food. I wish I had stayed in Belfast for two evenings so I could try some of their other dishes. Visited last year and we loved and raved about it. Different menu and frankly...hugely disappointed! Staff couldn't have been any more helpful but the food was pretty average. We are comparing it to last year which was one of our best meals ever but wouldn't rush back. Such a bummer as we expected a lot. Excellent dinner with friendly servers and interesting menu. Barge setting works well and is unique. We hosted a large party to celebrate our time in Belfast - the food and service were top notch. Traditional Irish fare but with a flare for flavor, home cooking, and locally sourced products. Great food and service. Would definitely come back. good food but small portions. Starter was beautiful. Main disappointing....violet potatoes off putting due to colour. Fish was nice but meal as a whole was nothing spectacular.